And it’s become one of my top favorite foods. Quinoa is satisfying, has appealing texture, is easily digestible, and is super versatile. Incorporating more of this magic grain into my daily fare is one of the lifestyle dietary changes that I attribute to helping me manage a healthy weight for these last 15 years. I’m always on the lookout look for vegetarian sources of protein in my diet. 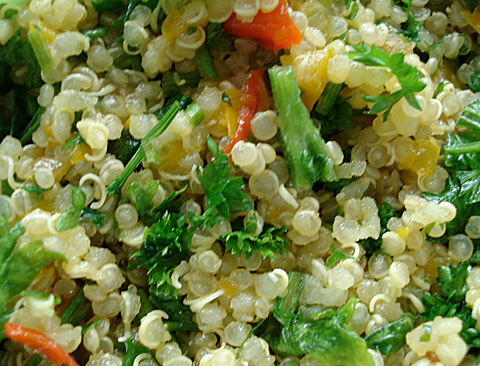 Quinoa contains more protein than any other grain; an average of 16.2 percent. Some varieties of quinoa are more than 20 percent protein. 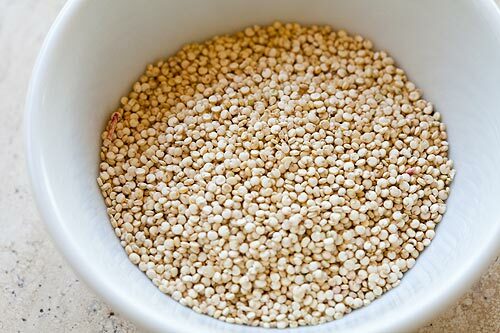 Quinoa’s protein is high in lysine, methionine and cystine and is of an unusually high quality. It is a complete protein, with an essential amino acid balance close to the ideal nutritional complex similar to milk but without the effects of dairy. Quinoa is light, tasty, and easy to digest. It is not sticky or heavy like most other grains, and it has a delicious flavor all its own. I used to love to eat rice, pasta, and white potatoes. But those foods were hard to process and caused me weight gain and lethargy. Quinoa can be substituted for almost any grain in almost any recipe. It looks and tastes great on its own, or in any dish from soup to salad and even as a sweet treat. Quinoa is quick and convenient to prepare. A whole-grain dish of quinoa takes just 15 minutes. Many people eat grains only during the colder months, but quinoa’s lightness combined with its versatility in cold dishes like salads and desserts makes it an ideal source of good summertime nutrition. Here’s a quick and easy Quinoa Salad recipe that I make almost weekly. Enjoy! 1. Bring 2 quarts salted water to a boil. Add quinoa, cover, and reduce heat to medium-low. Simmer 12 to 14 minutes, or until quinoa is tender and small “tails” bloom from grains. 2. Preheat oven to 400°F. Spread pine nuts on baking sheet, and toast 3 to 4 minutes, or until lightly browned. Cool, then transfer to large serving bowl. 3. Drain quinoa, and rinse under cold running water. Drain again. 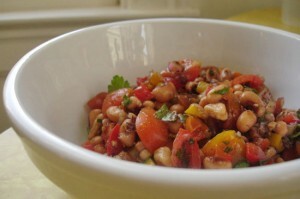 Add quinoa to pine nuts, and stir in cucumber, tomatoes, onion, and parsley. Fold in oil, lemon juice, and lemon zest, and season with salt and pepper, if desired. George Theodore “Teddy” McDonald Jr. This week one of my oldest best friends died suddenly of a heart attack at 43. His funeral was yesterday. It has happened so fast that it has not even begun to sink in. In the midst of funeral planning and friends coming in from all over the country, the Boston Marathon was bombed maliciously in a terrorist attack. And a day later a factory explosion in Texas is still burning with untold casualties. Not to mention earthquakes, war, and giant sinkholes freakishly swallowing large tracts of land. Unbelievable bad news continues to pile on. Meanwhile old friends bid the final farewell to a brother, his family, and then to each other as we return to the daily routines that run our lives. When someone dies everything seems to come into a more clear perspective. We enter a heightened state of awareness of the preciousness of time and relationships. We complain less, are more forgiving, and show more kindness and compassion towards one another. These are traits of our true Nature. Then, it seems, that the grasp on the splendor of our reality slowly fades. Not long after touching the sensitivity of Spirit, we find ourselves back in the fast paced, anxiety addled, harsh contexts from which we temporarily emerged. Once again we are separated from ourselves and the connection to the radiance of the forever-illuminated Light within. The loss of life and limb awakens us to the actuality that life is utterly fragile and that we have a finite number of heart beats allotted to us, pre-determined by our Maker. How can we stay more consistently connected to this precious certainty? Humbly, I offer, from my own experience, yoga. Every time I come to a place of vibrant repose, awake and aware in relaxation, I become deeply still and internally quiet. This enables a connection to subtle realms of consciousness. Some call this the Higher Self or the part of us that is eternal, unchanging and luminous. I enter this brilliant and fragile state most often in Savasana, not ironically translated as ‘corpse pose’. Meeting this other-worldly part of myself on a daily basis is Yoga. And it’s from this place and experience that I can relate tangibly to the Spirits of those who have gone before me. The physical loss of my friend hurts. Even more painful is thinking of the hole that has been left in his home amongst his immediate family. It’s almost unbearable and I can not stop crying for them and selfishly for myself at never being able to see his smile or hear his laugh again. Life in the physical world stops for nothing. We must find ways to move through the days without being crippled by the unending tide of bad news and sadness. Most people don’t associate eating at LuLu’s with a yoga retreat. But Friday afternoon that collaboration manifests with the first ever Yoga Birds weekend retreat, catered by my mother’s restaurant LuLu’s at Homeport. The retreat has been seven months in the making. I am ready and excited for the yogis to arrive. In the beginning planning stages I forecasted 8-10 folks attending. The coordinator at Camp Beckwith advised me to set my capacity higher, really just to be on the safe side to reserve rooms. So I set it at 20. Fifteen sign-ups in the first two weeks. I called the retreat center again and upped it to 30. I really did not anticipate selling out. But it happened. This is totally great news, right? Yes. And then well… a couple of months into it, my original plan for catering fell through. And my second choice was not available. 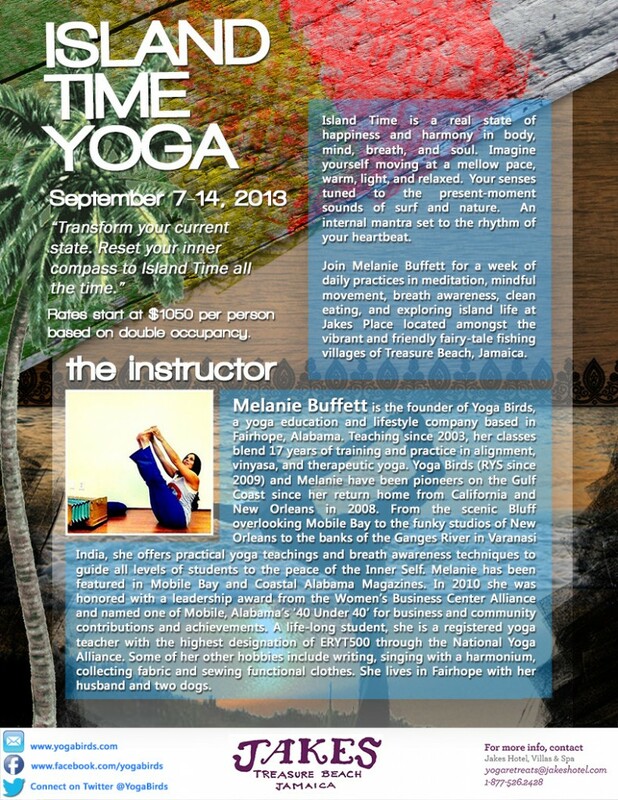 Teaching yoga…I got that. Feeding 30 people over an entire weekend…panic mode set in. Obviously a call to my mom was in order. I needed motherly comfort-words and somebody to tell me ‘everything will work out.’ Plus, she is, after all, THE ultimate dinner-party guru of the Gulf Coast. If yoga is clarity, steadiness, and skill in action, then my mother’s yoga is the ability to feed large numbers of people with brilliant ease and a smile. Hence, the phenomenal success of LuLu’s. 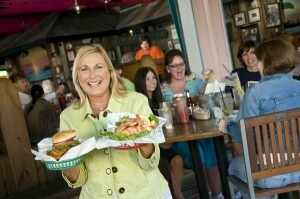 Her restaurant is one of the top tourist destinations in Alabama and one of the highest grossing restaurants in the U.S. Her most famous offerings are her stellar Gumbo and (naturally) the Cheeseburger in Paradise. And although the burger is consciously made with local grass fed beef (which is unheard-of in these parts and in the high-volume restaurant industry in general), it is probably understandable that LuLu’s was not my first choice in doing the food for my all-vegetarian yoga retreat weekend. Like an awesome mom, she totally stepped up for me, offering to help in any way that she or the restaurant could. In our initial conversation we thought there might be a few items on the LuLu’s menu that we could use. And then the plan was for her to personally work in her home kitchen to make the remainder of what the LuLu’s kitchen could not accommodate. With yogis in mind, we embarked on detailed menu planning. We pulled items from all areas of the LuLu’s menu. And before we knew it, we had crafted nearly the entire vegetarian yoga retreat menu. We altered a few things by placing cheese and dairy products on the side and making soup with vegetable instead of chicken stock. We did add a couple of ‘outside’ items. But the majority of the meals are ‘ALL LuLu’. A brief synopsis of the weekend fare is: Friday night, a Greek salad, lentil soup, hummus, and pita. Saturday lunch is a big beautiful garden salad, LuLu’s famous Alabama caviar (pea dip salad), and raw veggies. Saturday dinner is black beans, brown rice, Cantina Salad, guacamole, salsa, and tortilla chips. Sunday is a ‘brown bag’ to-go lunch with my recipe for quinoa salad, an apple, and pita chips. Breakfast is granola, fresh fruit, juices, and muffins. LuLu’s might be most well known for cheeseburgers, crab-melts, key lime pie, and margaritas. But you don’t have to dig too deep in her menu to find excellent choices fit for a bunch of vegetarian yogis. 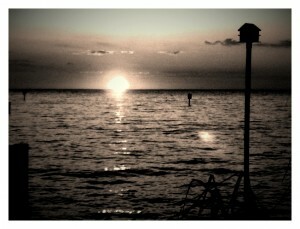 Check out mom’s place at www.lulubuffett.com. For almost ever, there has been nothing that paralyzes me with anxiety more than wearing a bathing suit in front of people. This was highly inconvenient growing up on waterfront property and living in a town where life happens on The Bay. Not to mention that Summer is about 8 months long. A crippling negative body image settled in to my psyche around five years old. And has pretty much held a grip on me (manifesting into a rock hard ball of tension in the core of my belly) until very recently. Last year when I turned 40 I ‘gave’ myself Restorative Yoga for my birthday. 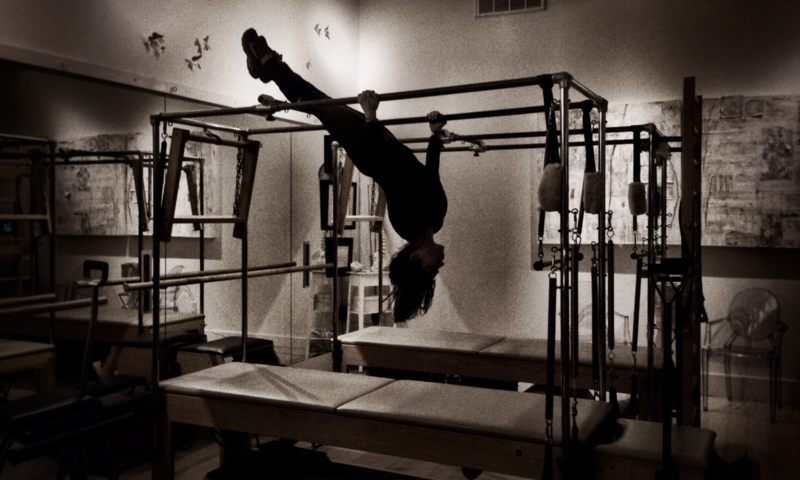 Basically I allowed myself to use more of my mat time in less vigorous practices. A couple of funny and wonderful things have happened. My active practice has evolved into a few times a week doing the traditional Ashtanga Vinyasa Yoga Primary Series (which has always seemed ‘out of reach’ physically but is now quite joyful). I do restorative poses daily…sometimes as a full practice, sometimes just one or two poses. Really whatever time and schedule allows. Everyday I take my restorative medicine. Everyday I allow myself to meet my inner state. It, like daily meds tend to do, has profoundly affected my overall mental state in a most positive fashion. I’m not sure what force intervened that day and helped me accept this great honor and offer by the magazine. But I do know that as shoot day approached, with nervousness rising, I just–did what I do- pause, turn in, focus on breathing, calm again. Repeat. My daily practices of yoga and meditation continue without fail no matter what is happening, so I always have the support of my ‘meds’. I carried my yoga practice with me to the shoot and throughout the whole day. The most liberating part about the whole experience was that I felt comfortable and confident in my skin. I had a blast trying on as many bathing suits as time would allow. Who is this person?!?!? It was fun. I felt great. And I am not only still breathing, but excited to get out on the beach in a bathing suit this Summer! Thirty-five years of the shackles of severe self-consciousness issues…gone bye-bye! Bathing suit shopping here I come! I could not have arrived at this victorious moment without my yoga. I bow to it and to a new found 40 year old inner peace and calm…the depths of which are apparently endless. Yesterday, Christians all over the world celebrated Jesus. I was one of them. I admit though, that for most of my life the Reese’s Peanut Butter Egg really did steal the show on Easter Sunday. Even in my adult yogi years I have been known to go out on my own version of a desperate ‘egg hunt’ on Easter Sundays looking for any drug store to be opened and to hopefully find one or two of the always faithful giant Resse’s Peanut Butter Cups (in my view, disguised as holy candy) still available. They really are a favorite among many and are hard to find past 5pm on Easter Saturday. Last week, a Champion Juicer moved into my house. Along with a 10 lb bag of carrots, both thanks to my sister who must make room in her kitchen for the needs of her twin toddlers. So this year I thought that instead of succumbing to the peanut butter egg drama (which never leaves me feeling all bright and sunny on the inside), I would start a new tradition of making a big pitcher of carrot apple ginger juice for us all. 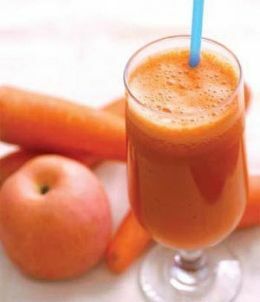 My sister’s family and my own drank the juice and started our blessed Sunday with a healthy dose of fruits and veggies. We really had one of the best days together in as long as I can remember. Yesterday was testament that good food in our lives equals good vibes all around. The Champion Juicer is awesome! I can’t believe it lives in my kitchen now. We are destined to become great friends. And the Peanut Butter Egg….well, it will always be around at Easter if I need it. But from here on out, I think I am much better off with The King of The Juice.